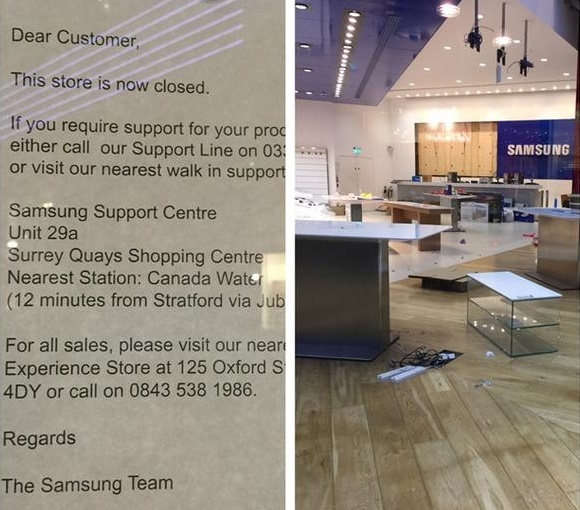 After announcing the shutdown of ChatON and WatchON, Samsung now closes a retail location in London, leaving only nine Experience Stores across the UK still open. Although the winter holiday season is a time to celebrate, it looks like Samsung has no reasons to do that. The company recently closed their flagship store in London, located at the Westfield Stratford City shopping center. According to The Verge, calls to the customer support line are now greeted with an automated message that reveals what images posted by Najeeb Khan on Twitter has already shown - the Samsung Experience Store in Westfield is now closed for good. A statement by the South Korean company reads "We remain fully committed to the operation of the remaining nine Samsung Experience Stores across the UK, and wish to reassure our customers that those stores will not be affected by this decision." Samsung announced plans to open 60 new retail locations across Europe back in early 2014, but these plans may have been revised in the meantime. The company no longer sells laptops on the old continent and remains to see what other changes they announce in the coming months.